Designing, building and maintaining public space in a city is a never-ending task. Who should do it, and how exactly? When do we know the process we have in place is no longer adequate? How do we go about changing this process, making it more transparent, inclusive and creative? These were some of the questions four organizations from four Balkan cities tried answering through their project Our City, Our Stage. Much of the quality public space in the Balkans ended up lost in transition. Squeezed between constantly shrinking municipal budgets and persistent expansion of privatization, it is often neglected to the point where it becomes avoided rather than enjoyed. Civic initiatives addressing this issue exist, but they are disjointed and short-lived; municipal departments try, but they fall into the service of special political interests and corporate lobbies too easily. It seems necessary to find a way of putting citizens back into the public space as not only users, but creators, who have the right to public space and an obligation to care about the way it is negotiated and managed. With this idea in mind, early in 2016 a group made up of NGOs Belgrade Flower Festival (Belgrade), ArchCommune – Center for Architecture and Culture (Podgorica), Center for Environment (Banja Luka) and Coalition for Sustainable Development (Skopje) began working on a regional project. The title Our City, Our Stage already said something about the goals: to get people to express themselves creatively, to use the public space and improve upon it in the process. The project was started and implemented simultaneously in four cities, aiming to draw attention to the similar urban challenges in the region, and to provide opportunities for the organizations behind the project to learn from each other and broaden cooperation. To get people to go outside and do something good for communal space, we went to the Internet first, naturally. We spent a couple of months building an online platform that would serve as a tool for people to map interesting spaces, suggest solutions, promote ideas and gather support from their friends and neighbors. It was important to us to make this from scratch – rather than adopt one of the existing, globally known solutions (think Better Block, for example) – because we wanted to be in full control of the system’s logic, and have everything entirely adjusted to local languages. Once the platform was up and running, we planned on spreading the word, gathering proposals, and providing some logistical and financial help to the groups most eager to jump into action. The process that followed was an amalgam of different ideas and interventions: reusing an old cinema building, mending playgrounds, promoting recycling techniques, creating street art, to name just a few, all brought to life by the combination of online and offline interactions between practitioners, activists, citizens and public authorities. While coordinating the portion of the project implemented in Podgorica, as a member of ArchCommune, I witnessed firsthand how demanding the process of establishing trust between different groups of actors can be. 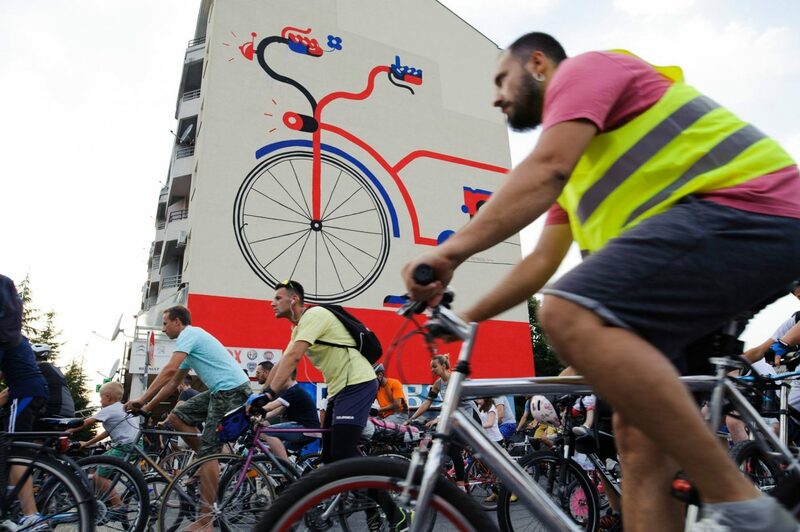 In order to learn how dwellers of a building feel about a mural that local cycling association Biciklo.me wanted to paint on their wall, we had to interview all 60 of them, by knocking on every door multiple times, over the course of several months. It might sound a bit extreme, but that was what it took: the interest in taking part in the activities of the Dwellers’ Association was so low in this edifice that there was no point in organizing a meeting; we tried and failed more than once. After months of one-on-one conversations about the proposed mural and other activities related to improving public space at this location, we finally got the permission, but only after we made it absolutely clear that our organization is not making any money off of the project. The next stop was the municipal Office of Communal Works, where we got the support and the necessary permits to carry on with the project, but where our mural was, for the sake of paperwork, presented as a billboard. The reason: the municipality has an established procedure for allowing companies and citizens to set up a billboard, but nothing when it comes to painting murals. That is why the city usually denies requests for mural painting. These two examples – citizens being suspicious of anyone trying to do work in public space just for the sake of creating a better public space, and city agencies supporting advertising in public space, but not developing procedures that would encourage street art – are quite illustrative of the general atmosphere, which anyone wishing to tackle urban issues in Podgorica from the independent and/or activist perspective has to face. Distrustful citizens and their lack of initiative is matched by the distrustful institutions and their lack of initiative; such is the usual order of things, so any action with the potential to change this norm is suspicious by default. And, of course, quite necessary. 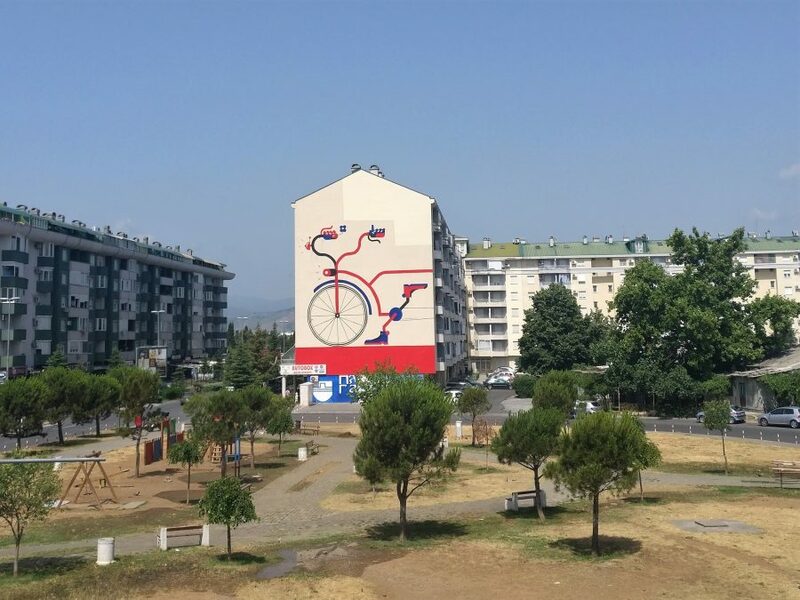 After securing the support of all the stakeholders and gathering a team of several activist and artistic organizations around this idea, we succeeded in painting the mural – the tallest mural in Podgorica, for now – and reviving part of a small public park in its immediate vicinity by planting new trees and installing a bench and bike parking racks specially designed for this spot. Intensive previous communication with locals now paid off. They showed interest in helping with the works, provided some of the equipment we needed, or just enjoyed hanging out and keeping an eye on how the work progressed. Once our spatial intervention was over, the consensus of the community we pulled into this process was that they would like to be part of something like this again, but they are not sure if they would ever start some sort of spatial initiative on their own. A couple of artists and graffiti enthusiasts are an exception, as they went on to pursue opportunities to create street art in other parts of the city, and elsewhere in Montenegro. This example from Podgorica could be supplemented by numerous similar stories from other cities of the region. What it shows is that it is challenging, but not impossible to include people who are not activists in civic actions concerning public spaces. They might not have become activist themselves, but they played a role in something that changed their part of the city for the better, and they no longer believe that working together to improve local park is futile. Also, this experience showcases the importance of cooperation and coordination: of course, not every activist initiative and intervention need to be handled by an established entity, such as non-governmental organization, but it helps to bring together some sort of a team and present clearly to the people we want to engage what the goal is, what we can and cannot do, and what we are responsible for. It may sound too simple and quite obvious, but precise communication and polite persistence can go a long way in the communities where it’s almost impossible to hold even Dwellers’ Association meetings due to lack of interest in communal matters. The mural we created through Our City, Our Stage project got a significant amount of public and media attention, and inspired several informal groups of citizens to use our online platform and propose interventions in other parts of the city. 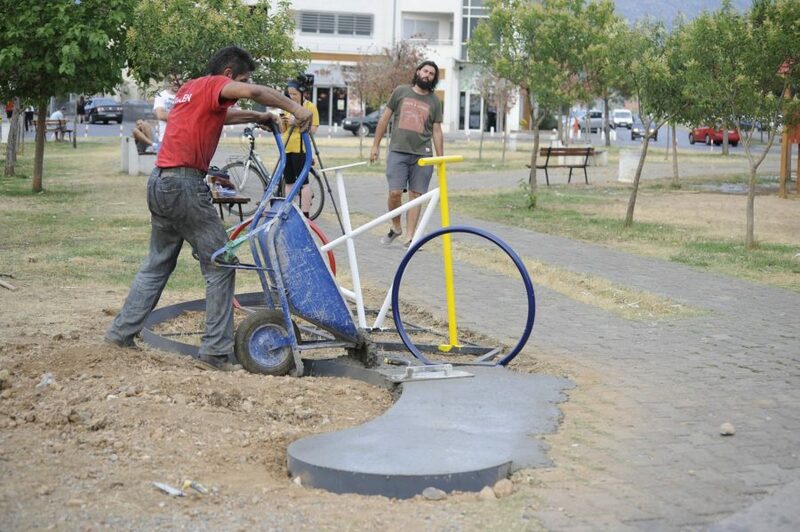 Moreover, several neighborhood initiatives unrelated to our project were started in the last few months, with citizens self-organizing and raising funds to refurbish public parks and playgrounds. We communicate, try to help each other out and cooperate if we can. As our project is drawing to a close, we are preparing recommendations based on what we have learned. Requesting that the city finally make murals legal is definitely on the list. Sonja Dragovic previously wrote about biciklo.me and efforts to support urban cycling. Previous Previous post: Is Contemporary Architecture Anti-Urban?